As always lately I’m posting rather late on a Sunday and still hoping that people will read my posts and try the recipes I post. I’m not sure that’s how the internet works but if you are reading this: thank you! 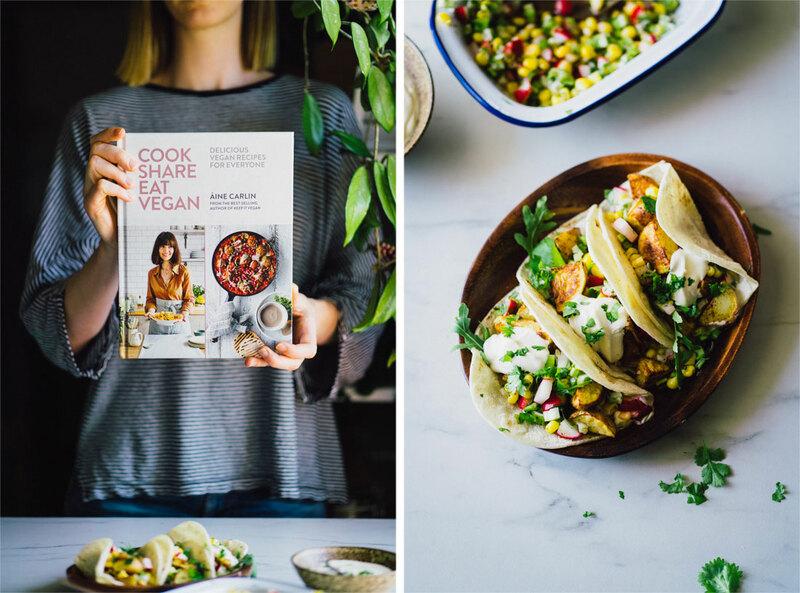 I hope you try this recipe 😉 It’s actually a recipe from the lovely Aine Carlin’s new book Cook Share Eat Vegan which is a steal on Amazon UK at the moment so if you feel tempted by this post to get it – seize thew moment. 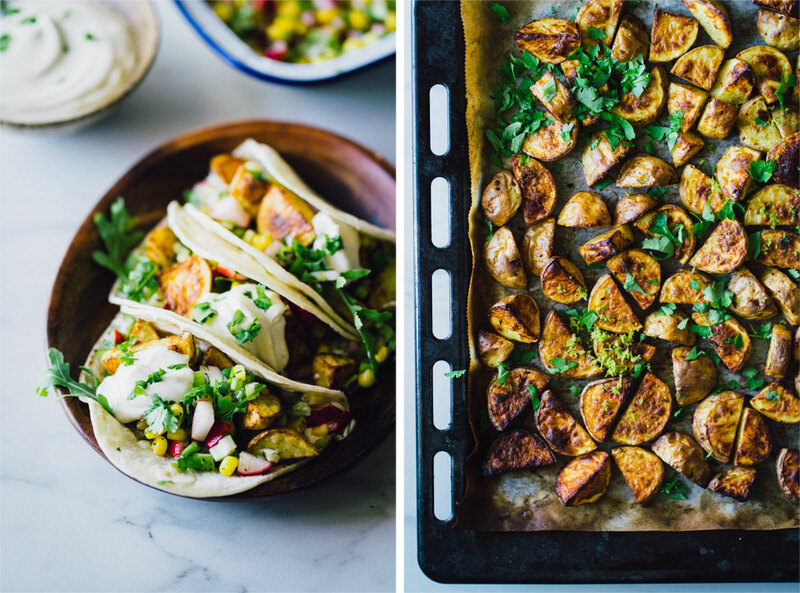 And the recipe is for crsipy cinnamon potato tacos and they are yum yum. Rob loved them too! When you scroll down to look at the recipe you might think there are a lot of ingredients there, and there are quite a few, but they don’t make for a complicated recipe even if that first glance tells you so. 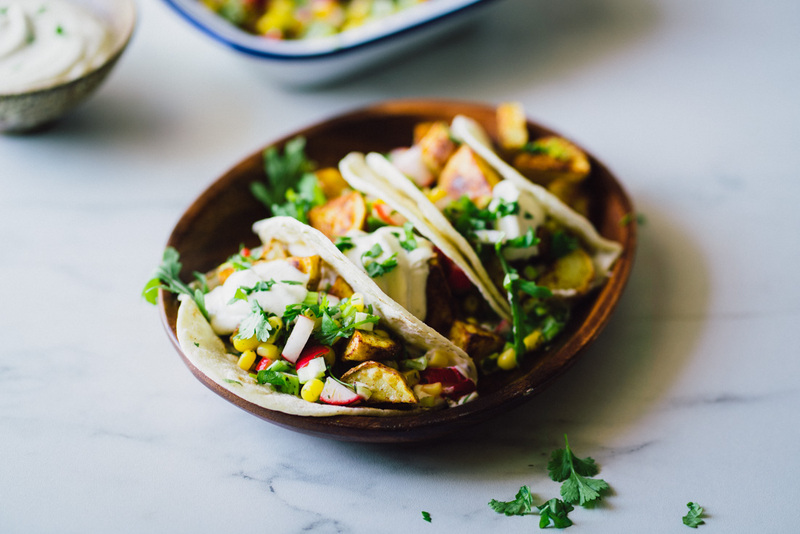 Aine has written a fuss-free recipe which combines three components to fill the tortilla with along with some rocket. There’s the crispy potatoes which are so delicious, I think they would work great in many dishes or as a side for other meals with complimentary flavours. 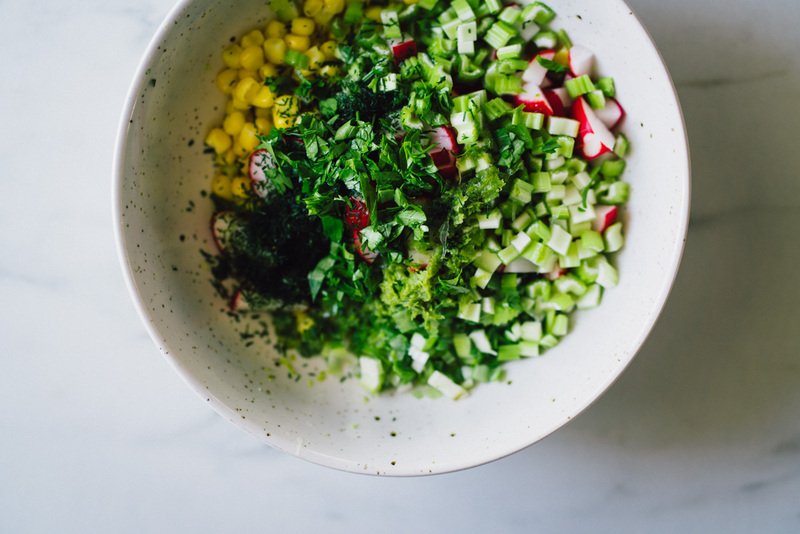 Then there’s a radish and sweetcorn salsa which I think is clever and since radish is the first vegetable to pop up in my garden I’m excited to utilise them again in this creative way. 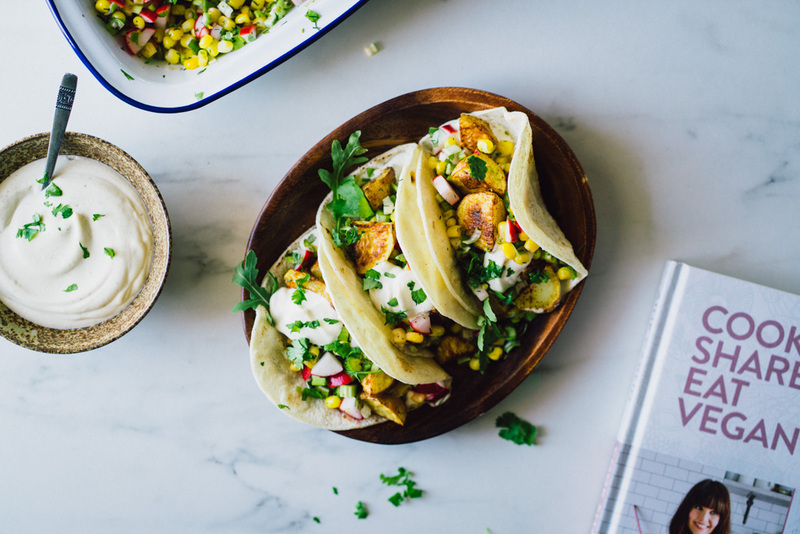 And finally there’s the cashew sour cream which is like the icing on the cake (taco). Never tried to make it before actually but it’s definitely going to become a staple over here. 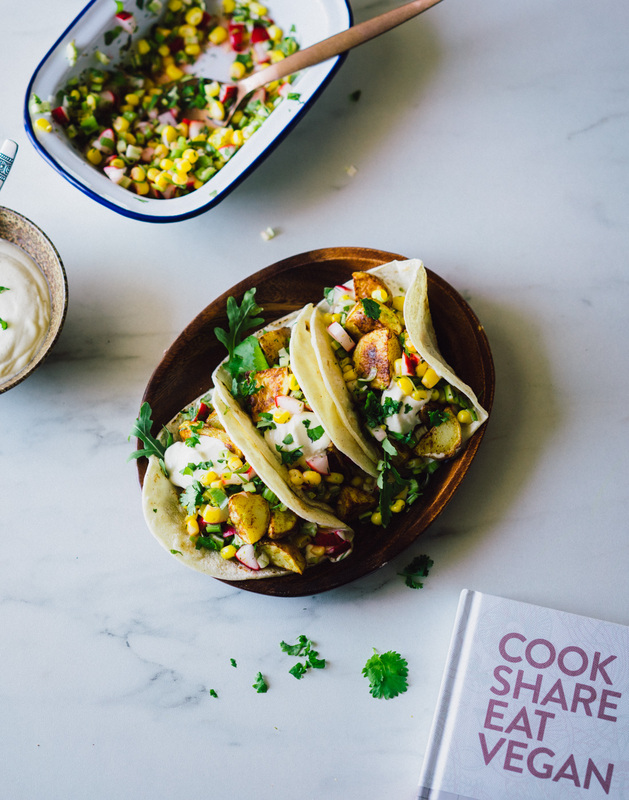 Altogether these components make for some seriously tasty, and very filling, tacos and though I haven’t had the chance to try many other recipes from the book yet I’m in love with almost every page. With that said I’m quite convinced you guys will appreciate it too. To add to the beauty of the food the graphics in the book are lovely and the colour scheme very aesthetically pleasing. 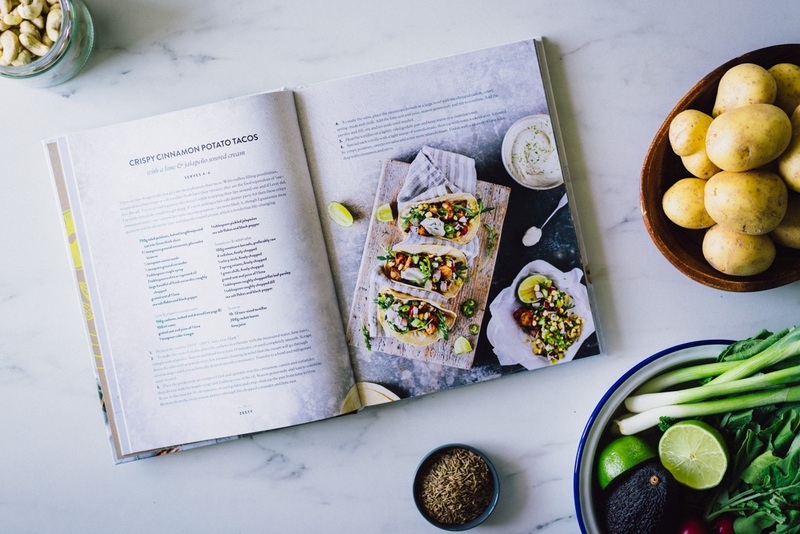 I think Aine has a great eye and I would definitely trust her to make a great cookbook as she’s had success with several others before releasing this new addition. So. 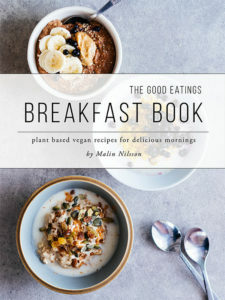 Try the recipe and go support my girl Aine and her new book! And enjoy! You can also find Aine on her instagram (which is one of my personal favourites) and her blog. To make the soured cream, place the cashews in a blender with the measured water, lime juice, vinegar and jalapenos. Season and blend for at least 10 minutes, or until completely smooth. (This took less time in my vitamix). Scrape down the sides with a spatula every few minutes, bearing in mind that the cream will go through several stages until you achieve the desired smooth consistency. Transfer to a bowl and refrigerate until needed. 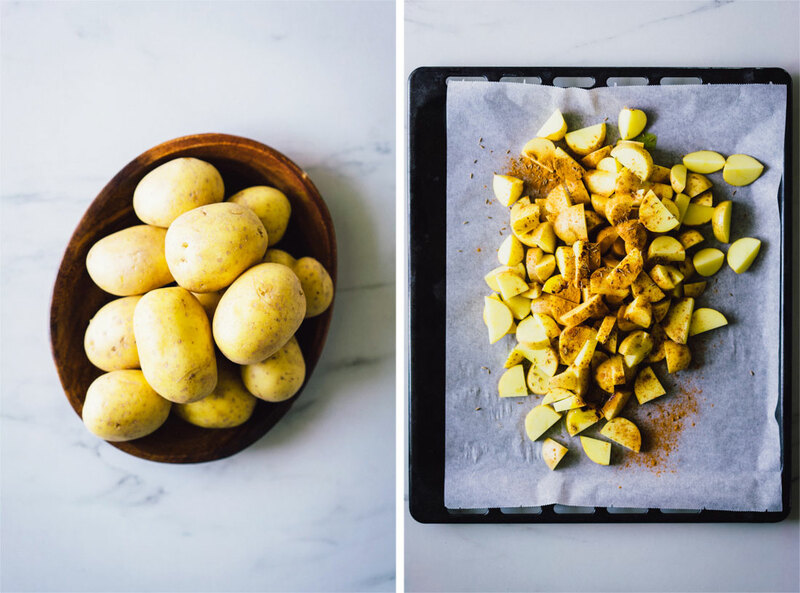 Place the potatoes in an ovenproof dish and sprinkle over the cinnamon, cumin seeds and ground coriander, then drizzle with maple syrup and 2 tbsp of the oil. Season generously and toss to combine. Roast in the oven for 35-40 minutes, or until golden and crisp, shaking the pan from time to time. 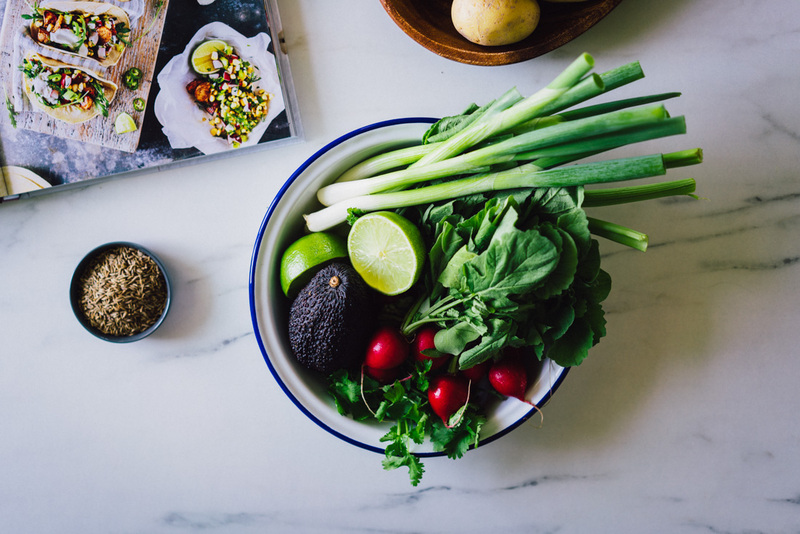 Remove from the oven, season and toss through the chopped coriander and lime zest. 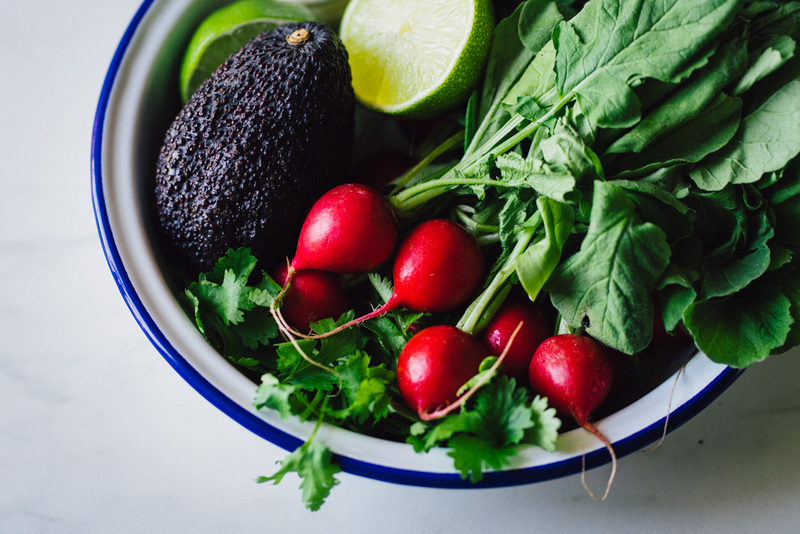 To make the salsa, place the sweetcorn kernels in a large bowl with the chopped radish, celery, spring onion and chilli. Add the lime zest and juice, season generously and stir to combine. Add the parsley and dill, stir and set aside until needed. Heat the tortillas on a lightly oiled griddle pan and keep warm in a clean tea towel. )I simply warm mine in a dry pan or at my lazier times on top of the toaster). 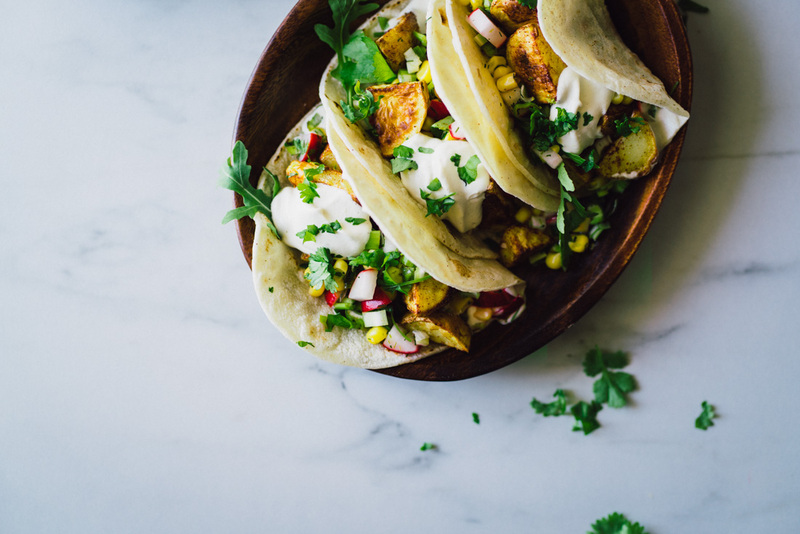 Spread each tortilla with a light smear of soured cream, then top with some rocket leaves, followed by crispy potatoes, sweetcorn salsa and some more soured cream. Finish with a squeeze of fresh lime juice, dust with cinnamon and serve. Very good recipe, your blog is beautiful and your videos too. thanks for sharing this with us. Thanks for the recommendation Malin, hadn’t heard of Aine before, assumed she was scandi, surprised she’d Irish, but for 6 quid thought I’d order the book anyway. 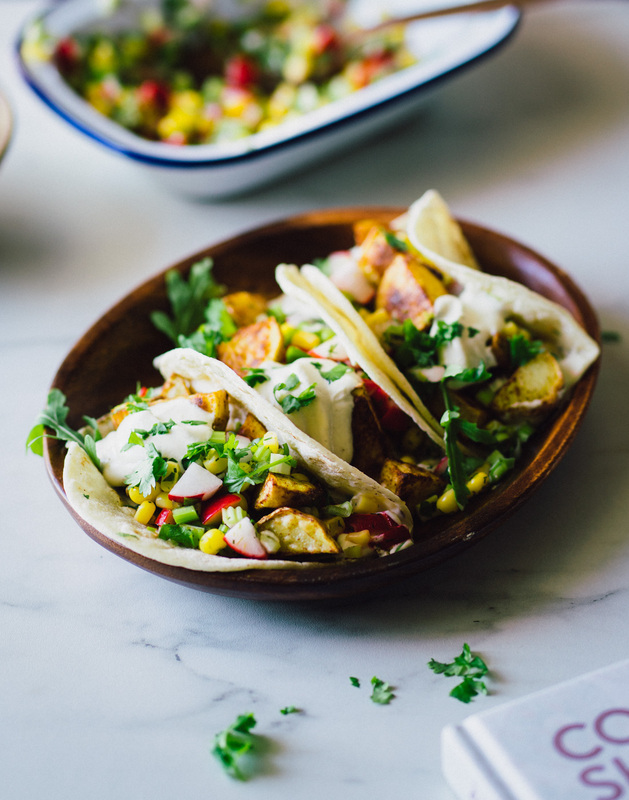 Very impressed with it, haven’t tried anything yet, but these potato tacos look great, slowly working my way through and transferring the recipes I like the look of to my phone which is how I like to cook.